A Chocolate F1B Labradoodle. 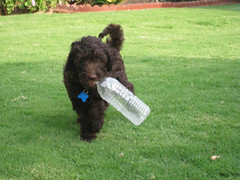 Visit our Labradoodle Breedersite to see more pictures of Labradoodles! You can also find more pics at doodlepictures.blogspot.com, or www.labradoodlelocator.com.